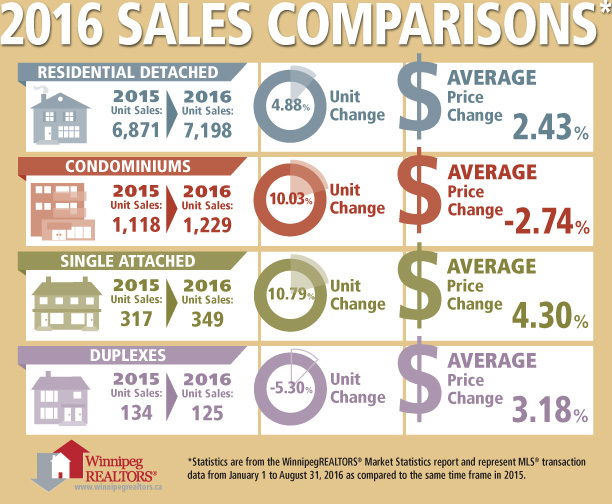 WINNIPEG – Summer vacations, the Olympics, Folklorama, Blue Bomber winning streak, and other August activities did not get in the way of buyers taking advantage of a healthy supply of some of the most affordable house prices in the country. August was indeed splendid with a new benchmark in sales established. For the first time in August, MLS® sales went over 1,300 to finish at 1,350. This represents an 11% increase over the 10-year average for this summer month and sets up a potential record-breaking sales year with sales ahead by nearly 7% with 4 months to go. Year-to-date dollar volume of over $2.7 billion is maintaining a record pace as well with a gain of over 8% in comparison to the first 8 months in 2015. Both August MLS® sales and dollar volume increased 7% in comparison to the same month last year. 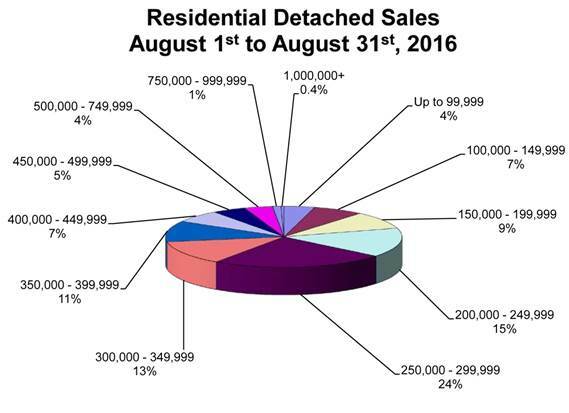 New listings were up only 3% while the inventory at the end of August of 5,148 listings is down 8% from 2015. Due in part to such solid sales activity this year, the two busiest MLS® property types – residential-detached and condominium –are down 11 and 9% respectively in available listings from last year. Condominium sales have made big strides over last year with a 14% increase in August over the same month in 2015 and 10% year-to-date. 2014 is the only year condo sales were better up until the end of August. One home in particular which caught some buyer’s eye was one in South Charleswood (south of Wilkes). It is the highest residential-detached MLS® sale this year at $2 million. There was also a house sale for $21,000. “When there is such a wide range of house prices within our market, a myriad of Winnipeg neighbourhoods and rural municipalities to choose from, and varying degrees of listing supply availability, you need to be talking to a REALTOR® about your own specific situation in order to make an informed decision” said Elston. The most active price range for residential-detached sales in August 2016 was from $250,000 to $299,999 at 24% of total sales. 15% of the sales activity was from $200,000 to $249,999 while another 13% was from $300,000 to $349,999. The average number of days to sell a home was 35 days, 3 days quicker than August 2015. The most active price range for condominiums in August 2016 was from $150,000 to $199,999 at 29% of total sales. Tied for second at 18% and well back in comparison were the $100,000 to $149,999 and $200,000 to $249,999 price ranges. Similar to residential-detached, a condominium sale price of $973,350 is the highest condo sale price this year. The average days on market for a condo sale was 47 days, 8 days faster than August 2016.